The Tonica Jazz Festival is gearing up for its ninth edition from July 3 to 13, with concerts and performances scheduled at various venues around the Guadalajara metropolitan area. The big ticket shows take place at the Teatro Degollado on July 3, 9, 10 and 12. 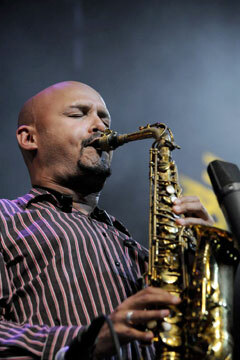 The finale with the New York-based Miguel Zenón Quartet on Saturday, July 12 promises to be the main highlight. Zenon is among the most celebrated alto saxophonists of his generation, a multi Grammy nominee and Guggenheim and MacArthur “Genius” Fellow who has extended jazz’s conceptual reach with a series of albums exploring the music of his native Puerto Rico. His quartet features pianist Luis Perdomo, bassist Hans Glawischnig and drummer Henry Cole. Another highlight is a concert dedicated to the work of the late Charles Mingus, an influential U.S. jazz double bassist, composer and bandleader. On stage on July 9 will be jazz trumpet and flugelhorn player Alex “Sasha” Sipiagin and Guadalajara’s Klaus Mayer Big Band. Two-time Grammy Award winning acoustic and electric bassist, composer and arranger, Boris Kozlov, will arrange and direct the homage, as well as perform. Also playing and giving master classes at the festival will be U.S. tenor-sax heavyweight David Murray, U.S. jazz fusion pioneer Gary Burton and Grammy Award-winning New York-based jazz trumpeter Brian Lynch. To see the complete festival program, as well as information on the master classes, seminars, Jazz Camp and other events, go to http://jaliscojazzfestival.com. Thursday, July 3, 8:30 p.m.
Saturday, July 5, 6-10 p.m.
Sunday, July 6, 6-10 p.m.
Wednesday, July 9, 8:30 p.m.
Thursday, July 10, 8:30 p.m.
Saturday, July 12, 5 p.m.
Saturday, July 12, 8:30 p.m.
Sunday, July 13, 10 a.m. to 12:30 p.m. Presentations by artists participating in the festival will take place at three locations along the route of the Via Recreativa: Plaza Universidad (Juarez & Colon), Parque Rojo/Revolucion (Federalismo & Juarez) and Parque Jose Clemente Orozco (Vallarta, between Minerva Glorieta and Los Arcos, city arches). Expect consecutive performances by at least four artists in each location. Participants in the festival’s Jazz Camp will be playing at the same time at other metro area locations, including the Plaza de Armas, Plaza Fundadores, Andador Ezcorza and Plaza Tapatia.